Grab Your Preferred Date ... Enquire Now! This very special summer all-inclusive Wedding Package Offer applies to dates May through to September 2019 and May through to September 2020. Read on to see what this fabulous offer includes and then to check if your preferred date is available, complete the enquiry form at the bottom and click the SUBMIT button. Beach Club Marquee, Terrace, Pool and Gardens. The outstanding Kings Room is where you and your guests will be seated for your wedding breakfast. With a capacity of up to 200 guests, this wonderful event space provides the perfect ambience for a wedding celebration. When it comes to partying, then the Kings Room really comes into its own. When the wedding breakfast is done, it’s time to truly celebrate your big day and the Kings Room doesn’t disappoint. The gorgeous lighting system that bathed your wedding breakfast in complimentary lighting can now be changed to ‘party mode’ and the brilliant sound system that provided clarity to the speeches can now be put to ‘full-blown’ party use. The Kings Room is only a small part of this all-inclusive wedding package. Read on to see what else is offered. 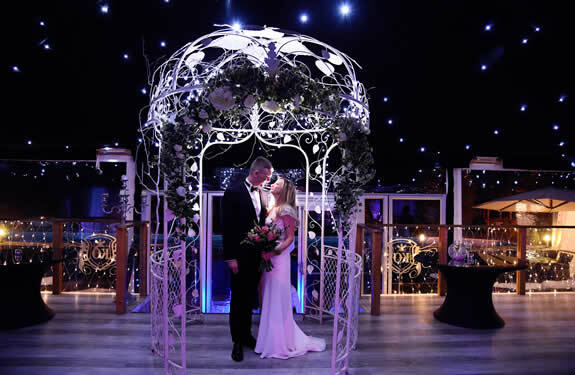 OK, part two of our all-inclusive wedding package includes the stunning and chic Beach Club marquee with its gorgeous star-lit ceiling and romantic pergola is where your ceremony will take place. Overlooking the pool, terrace and pool gardens, this wonderful setting is just the impressive start of your all-inclusive wedding day. The Beach Club can be fully opened out to the Kings Room to allow additional space, or it can be kept separate with our stunning glass folding doors that allow for a quieter ‘chill area’ later on when the party really gets started..! If it’s a hot summers day, we can open out the sides of the Beach Club marquee to the pool terrace which makes for an almost ‘Al Fresco’ wedding ceremony. What better way to start your post-ceremony celebrations than to be sipping sparkling Prosecco on the chic terrace, whilst overlooking the stunning pool and poolside gardens. 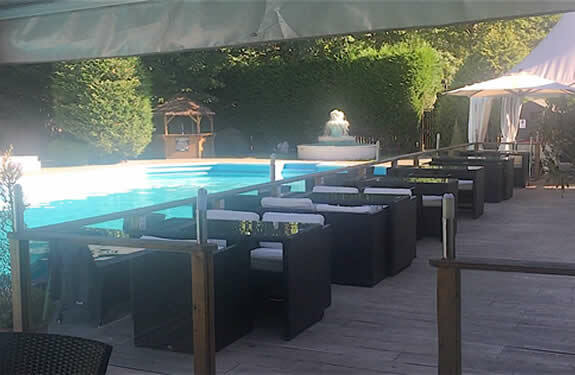 The poolside terrace is just three steps away from the Beach Club marquee and as you step down from the wedding pergola you’ll be greeted by your waiting staff with your first glass of ‘bubbly’. Then, you can greet your guests and they can circulate on the terrace sipping their drinks and enjoying canapes prior to the wedding breakfast. Terrace seating and tables are provided for your wedding guests convenience. When we say an all-inclusive wedding package, we mean it. Just like the other areas, you will have exclusive use for you and your guests to use the pool and gardens. With a backdrop of the magnificent forest trees and atmospheric lighting at night, this is truly a magical place. Your guests can wander freely around the pool area and gardens, and make use of the ‘Marbella Style’ beds and tables both before and after the Wedding Breakfast. It’s a magnificent area for some really special photographs, and your photographer will love the vibrant colours the pool and gardens have to offer. The whole experience will have your guests talking about your ‘special day’ for years to come. Amazing KO Royale Exclusive Wedding Package? Successful weddings need planning, cool heads and experience. This all-inclusive wedding package has been designed to include most aspects that we find are most popular. 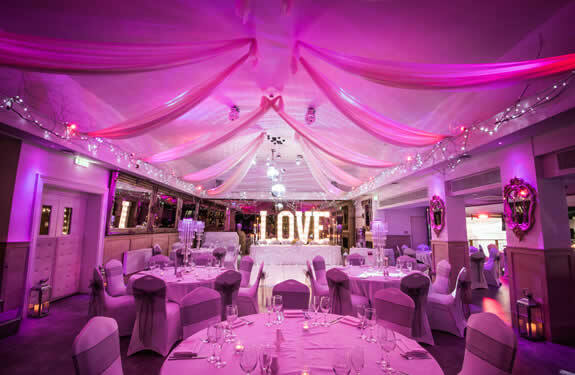 Our events team have organised hundreds of weddings, and even though each one is different, each requires a professional approach to ensure it goes right and as planned on the day. You only get one chance and we’re there to ensure that your ceremony goes without a hitch and is one to be savoured and remembered. For information on booking a registrar use this ESSEX REGISTRARS link. 3. Expect an email (or a phone call if you’ve provided your best contact number) with details of the availability of our amazing KO Royale Exclusive Summer Wedding Package.